Ethica, the Islamic finance industry’s leading certification institute, in an unprecedented move for the industry has launched a comprehensive online guidebook on Islamic Finance. The 700 page e-book entitled “Ethica’s Handbook of Islamic Finance (2013 Edition)” is a tome of practical, usable information that is the result of extensive of experience in applying the lofty standards of the Shariah in global financial markets. It seems poised to become the desktop reference for Islamic finance professionals. 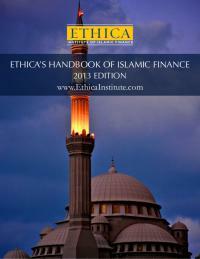 The work contains sample Islamic finance contracts, over 1,000 Q&As approved by leading scholars in the field, the entire “Meezan Bank Guide to Islamic Banking,” and study notes to Ethica’s award-winning Certified Islamic Finance Executive (CIFE) program, among other invaluable resources. It is currently available as a free download (see link below). Yet its publisher contends that what really make it unique is an emphasis on entrepreneurship. Details like sample contracts, product descriptions, and recommended reading lists target the newcomer who may not necessarily be interested in lining up for a job at a big bank. His horizons may extend to the entrepreneurial side of Islamic finance, which continues to be top-heavy with large banks dominating the headlines and smaller companies and start-ups largely absent from the industry.